Residents pick through rubble following a military air strike against suspected militant positions in the Tirah Valley, Khyber Agency, in late December 2012. Militants associated with Ansar-ul-Islam and Tehrik-e-Taliban-e Pakistan (TTP) have been battling each other over the strategic highlands of eastern Khyber for several months. Source: Pakistan Dunya News. Two nights ago, hundreds of Movement of the Taliban in Pakistan (Tehrik-e-Taliban-e Pakistan or TTP) militants overran the headquarters of a rival faction, Ansar-ul-Islam, deep inside the Tirah Valley, Khyber Agency, following months of fierce clashes between the two outlawed Islamist factions. Fighting between the two factions had intensified this weekend, and on Sunday, TTP fighters stormed Malikdinkhel and seized the Bagh headquarters and its surrounding bazaar, according to the News International. Emir of Ansar-ul-Islam Maulana Qazi Mehboob-ul Haq and General Secretary of Ansar-al Islam Qari Izzatullah Ham Khial reportedly fled the Bagh area for Zakhakhel shortly before the TTP overran Bagh. However, the homes of Mehboob and Izzatullah located in Malikdinkhel have since been blown up by TTP fighters, and their headquarters in Bagh is now under TTP control. Although the nearby areas of Shalobar and portions of Zakhakhel have also fallen to the TTP Lashkar-e-Islam fighters, Ansar-ul-Islam General Secretary Qari Izzatullah Ham Khial vowed that his group would defeat the rival factions from positions in Zakhakhel and Arakzai. 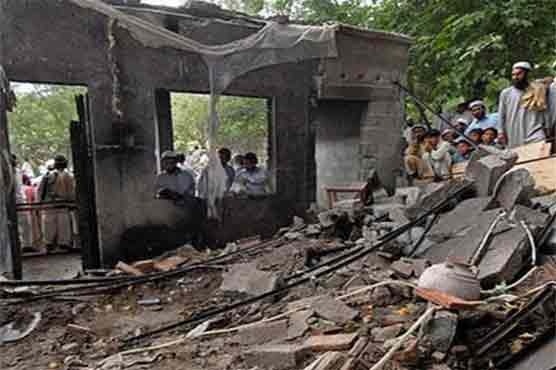 Shortly after the TTP takeover of Bagh on Monday, two Ansar-ul-Islam suicide bombers attacked TTP militants as they ransacked the Ansar-ul-Islam headquarters and killed 46 militants, including an Uzbek Uzbek commander named Abu Islam, according to a regional press report. Infighting in Khyber has forced 644 families belonging to the Qambarkhel tribe to flee for their lives this week, many of them taking up shelter in the Sanghara area of Arakzai Agency, adding to the already 24,000 displaced people fleeing the recent fighting in Khyber, according to the News International. Ansar-ul-Islam spokesman Sadat Afridi told the Express Tribune that Ansar-ul-Islam fighters have retaken the Haidar Kandao check post after fierce clashes with the TTP in Bar Qamber Khel, but he conceded that the TTP have regained control in Bhutan Sharif, Ziarat Sar, and Machapura areas. Additional fighting between the TTP and Ansar-ul-Islam has been reported in the Parail Sanghar, Dakhay, Difa, Angoray, Nandokhay, and Fateh Ziarat areas, with casualties mounting on both sides. Pakistani military jets have been pounding TTP positions around the Tirah Valley since February, including the latest round of strikes in the Tarkikhel and Durbikhel areas which reportedly destroyed three “hideouts.” Ansar-ul-Islam is allied with local Lashkar Aman (Peace Army) elements, and is suspected of receiving covert aid from the Pakistani government to act as a bulwark against TTP expansion, despite Pakistan’s outlawing of the group in 2008. TTP fighters and Ansar-ul-Islam have fought pitched battles in the Tirah Valley highlands since January, resulting in the deaths of over 80 fighters and civilians between Jan. 25 and Jan. 29 alone, according to RFE/RFL. Beginning in February, the militant faction Lashkar-e-Islam, a rival of Ansar-ul-Islam, reportedly launched coordinated attacks with the TTP against Ansar-ul-Islam in Khyber Agency. Particularly intense battles raged in late January and early February between the rival Islamist factions near the contested area of Kismat Sangar. In 2012, there were an estimated 130 militant groups operating in the Federally Administered Tribal Areas (FATA), with five major groups in Khyber Agency at the time pitted against each other, according to Ashraf Ali, director of the FATA Research Centre, an Islamabad-based think tank. The five major militant groups in Khyber Agency are, according to Ali: the TTP led by Tariq Afridi; Ansar-ul-Islam; Lashkar-e-Islam; Tauheed-e-Islam, jointly led by Tayyab and Ghunzha Gul; and Amer bil Maroof Wa-Nahee Anil Munkir, led by Maulvi Naamdar. Latif Afridi, a secular politician from Khyber Agency, warned RFE/RL in January that TTP and al Qaeda control of the Tirah Valley would have serious consequences for the security of the surrounding regions, namely the ability of the TTP to launch further attacks against Peshawar, the capital of Khyber Pakhtunkhwa province. The Tirah Valley has been a known haven for the TTP, the Lashkar-e-Islam, al Qaeda, and other Pakistani terror groups. Safe havens in the valley enable these terror groups to launch attacks inside Pakistan as well as across the border in Afghanistan’s Nangarhar province. The US drones targeted al Qaeda and Taliban forces in the Tirah Valley four times in 2010. In one such strike in December 2010, US drones killed Ibn Amin, a dual-hatted Taliban and al Qaeda military commander who operated in the Swat Valley. Taliban attacks in the region continue unabated. On Monday, two suicide bombers attacked the Judicial Complex in Peshawar, killing four people and wounding another 47, including two women. Earlier this week, TTP spokesman Ihsanullah ihsan announced that the group has ‘temporarily suspended’ its peace dialogue offer to the Pakistani government, pending the formation of a new government. However, Ihsan warned Pakistani citizens to stay away from the political rallies held by the ANP, Muttahida Qaumi Movement (MQM), and Pakistan’s People Party (PPP) — a veiled threat that the TTP would not refrain from continuing the terrorist campaign against Pakistani political organizations, leaders, and rallies.